The end of the year brings with it a big opportunity to recycle. Everyone is filing, archiving and cleaning out cupboards and storerooms to make space for the new year. These efforts often generate huge amounts of waste paper - not to mention the extra packaging from festive season celebrations! The Early Bird Catches the Worm - Start cleaning up sooner rather than later. Spring cleaning can become rather a daunting task, don't leave it for the last day! Failing to Plan is Planning to Fail - Set up a storage area, with separation at source facilities. This will ensure that double work is avoided. Plan to clean an office or a classroom a day. Teamwork Makes the Dream Work - don't be afraid to ask for assistance. Cleaning out does not have to be a chore, it can even be treated as a team building effort! 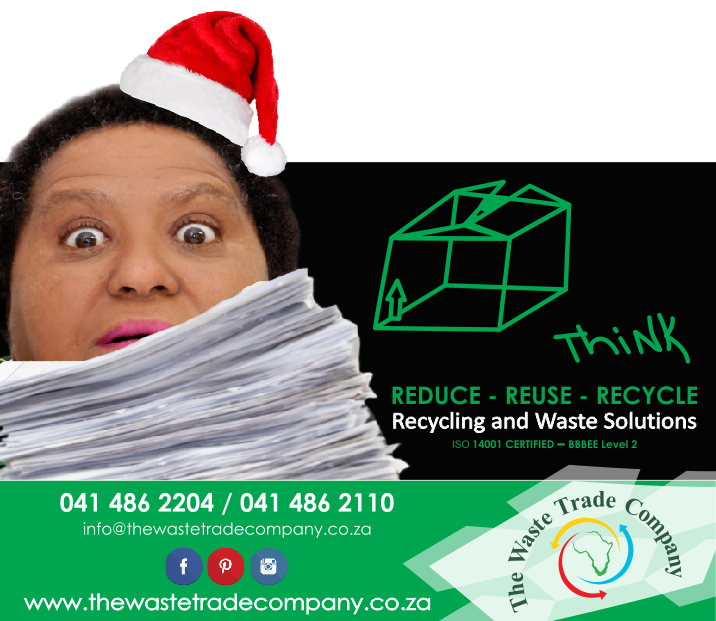 Waste Not Want Not - Festive season shopping can amount to a lot of additional packaging. Remember to use your own shopping bags and buy products in recyclable packaging. Turn Your Spoil Into Soil - Instead of throwing away your food waste, why not start a compost heap or buy a worm farm? Planting your own vegetable garden is a great way to spend time together as a family! Do Something Creative - Reuse your waste to make fun arts and crafts. Learn to knit with plastic bags, these make great gifts! Spread the Green Gospel - Remind your friends and family about the importance of recycling...better yet - collect recyclables from whoever you visit. Think Outside The Box - There are many ways to have a fun filled and blessed holiday whilst considering your environmental impact. Be innovative this festive season, and let your green light shine! Book your recycling collection by contacting The Waste Trade Company!